My default state is quiet. I rarely listen to music while I work, unless I need to make it easier to ignore background conversations. I often find one-on-one conversations awkward. I like group conversations because other people can tell stories or ask questions, and I can dip into or out of the conversation when I want. So Hacklab tends to work for me, since there are occasionally good group conversations there, and people are friends with each other. I started to write a blog post about preparing for winter, something along the lines of being less social because of the activation costs of having to put on coats and take the subway instead of the bike. But I started looking at the numbers from my time tracking (counting both business-related and social non-family connecting time), and I’ve actually been less social in summer. I suppose it makes sense – meetups go on hiatus, people have other plans, and I’m off enjoying quiet time gardening or biking. So maybe this fall and winter will be more social after all. Maybe I’ll make it out to Hacklab once or twice a week, and maybe I’ll start checking out meetups again. It’s good to practice connecting with people in person — although it’s certainly quite tempting to stay home, too. I have the sneaky suspicion that these online conversations might even be more worthwhile and longer-lasting. Still, there’s time to experiment with things, so why not? When it comes to socializing, I have a high coefficient of static friction. I tend to stay in place. If I let too long go between get-togethers, I fall out of the habit of hosting them, the identity of someone who brings people together. I rarely ever want to go out. I drag my feet. I look for excuses to stay at home. I resist when invited, and only manage to make myself go because of social expectations. When I’m there, though, sometimes it’s all right. Sometimes it’s awkward. But sometimes it’s fun and almost frictionless, and the time speeds by. I should remember those times so that it’s easier to push myself to go out. The risks are small, anyway. What makes some get-togethers feel okay? I like board games and card games. They create new situations for us to interact in and result in new in-jokes. They give my hands something to fiddle with. At the same time, there’s still space for conversation between rounds and during breaks. I find background conversations too distracting when I’m trying to work on something, so I prefer to work at home. Pair-hacking might be interesting, though. I like talking through complex things much more than conversations just about catching up. I like having a sense of accomplishment or learning. The weather’s warming up, so maybe I’ll have a get-together sometime. Gotta ramp up to it again. Maybe I’ll check out Gamfternoon at HackLab.to. Maybe I’ll try going to more HackLab open houses. Maybe I’ll invite people over for a casual get-together. Daylight Savings Time kicked in, so I guess introvert hibernation mode is winding down… We’ll see! UPDATE 2013/11/07: More notes at the end! I’ve been looking for ways to make it easier to help people online. ScheduleOnce + Skype/Google Hangout was great, but scheduling was a bit cumbersome, and sometimes one-hour chats felt a little awkward. 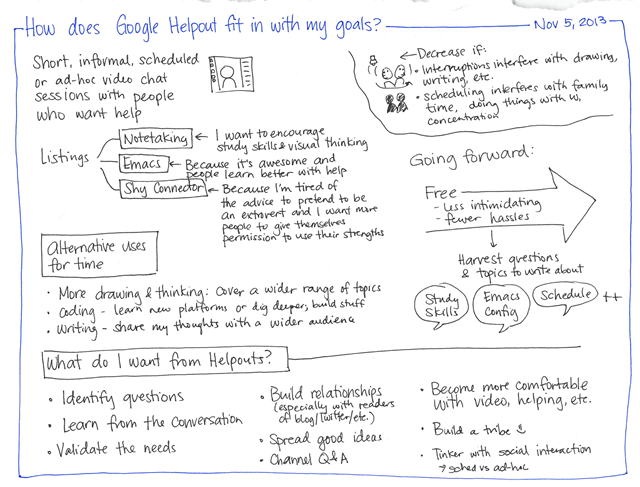 When Google announced their new Helpouts service, I signed up to be one of the early providers. 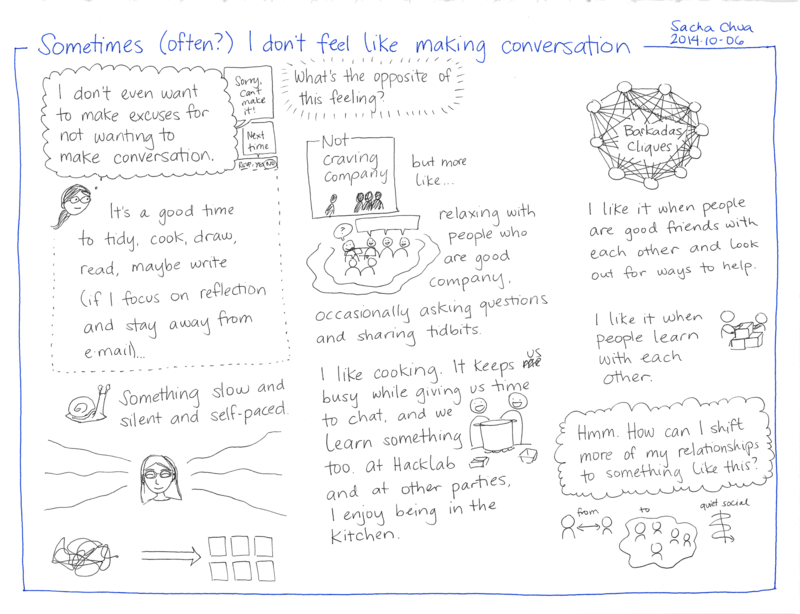 I started with note-taking and visual thinking because those are useful skills that a lot of people need help with, compared to digital sketchnoting workflows which would be a tiny tiny niche. 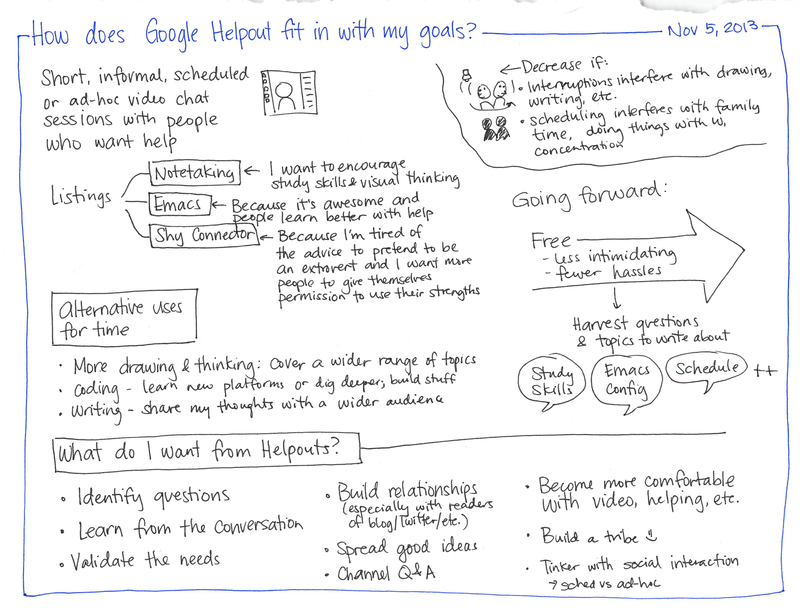 Although Google Helpouts lets you charge for your sessions, I decided to focus on giving help for free instead. I wanted to see what it was like and what I could help people with, and I didn’t want people to worry about the cost. I also didn’t want to worry about expectations! So I set up my Helpout listing, practised with a few people, and set aside some available slots in my calendar. And then it was the official launch day. 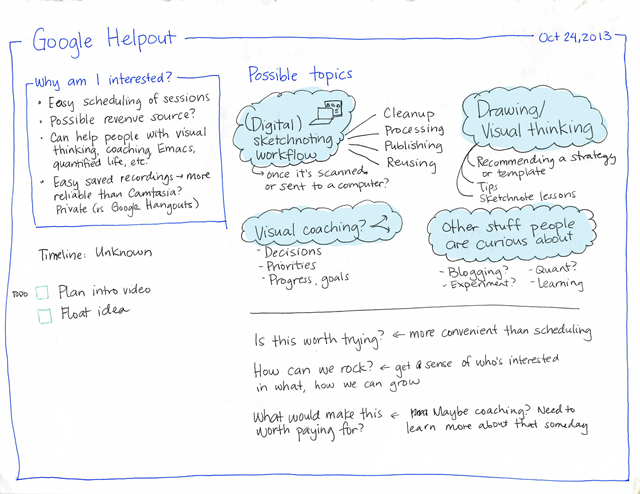 Google Helpouts was open! I woke up to more than a dozen sign-ups, and my phone kept buzzing with notifications throughout the day. It was exciting and scary at the same time. Many of the other Helpout providers said they were seeing a lot of no-shows. I didn’t mind because that meant I could get a bit of a breather in between the 15-minute sessions. I had some time to e-mail people and ask them some questions before starting, which really helped. I talked to students about study skills, teachers about teaching, and professionals about mindmaps and other thinking tools. I was nervous going in, but I was delighted to find that the conversations flowed well. I could think of questions for people to clarify what they needed and I shared tips that they could try. Afterwards, I felt a little buzzy, but not as much as I do from presentations (very very buzzed!) or hour-long chats. Since the service has just launched and I’m offering a free Helpout, many people who signed up probably won’t make it to the sessions. Coding is terrible when it comes to interruptions, but drawing seems to be just fine. I really like the way answering people’s quick questions helps me validate that people want and need what I can share, and it gives me a better sense of who’s out there. Over the next few weeks, I’m going to experiment with how this fits into my flow. Where do I want to put it in my schedule, and how does it interact with the other work I want to do? Because Helpouts can break my time into lots of little segments, I want to make sure I still have blocks of focused time for deep work. I also want to avoid introvert overwhelm, and I want to focus on proactive content instead of letting Helpouts swing me too much towards being reactive. That’s why I’ve been setting aside blocks of 1-2 hours for Helpout scheduling instead of letting it take over my day. Now that we’re off Daylight Savings Time, the sun sets pretty early too, so I’m experimenting with another change to my consulting schedule. I want to make sure that I do right by my consulting client, too, and I don’t want to drop my personal projects. Hardware-wise, I like my current setup. I handled all the calls from my newly-re-set-up desk downstairs, with a webcam, lights, and external monitor. I don’t want the sessions to interfere with W-‘s concentration, though. If he’s at home instead of at the gym, I can work in the kitchen with my extended battery. I’ll keep an Ethernet cable there as well. The kitchen isn’t as well-lit, but it will do. 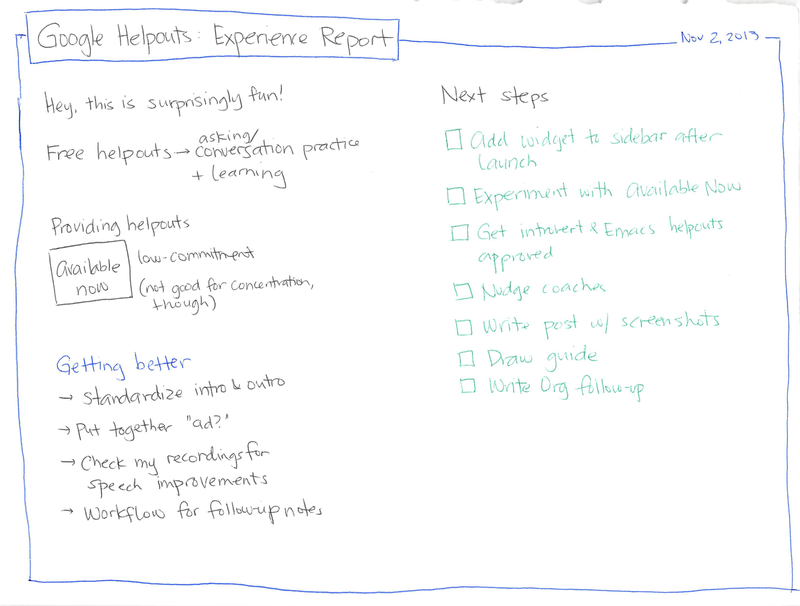 Want to give Helpouts a try? 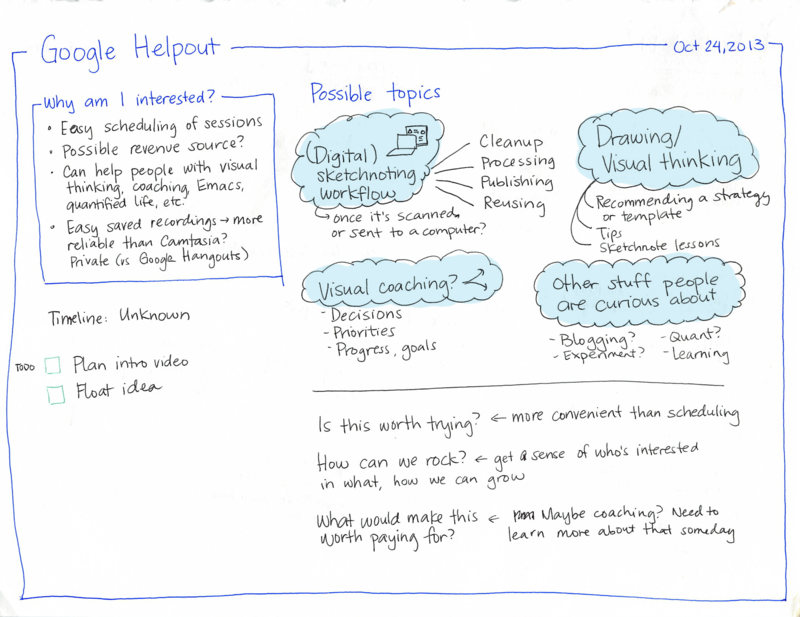 You can schedule a session with me at sach.ac/help or browse through the other sessions at helpouts.google.com. I think you can sign up there to offer your own, too. Have fun! I like some events but not others. I like events with interesting presentations, particularly if they’re short; I take notes. I don’t like parties that mostly have strangers. I don’t like events that are all about networking. Dinners are a bit of a gamble. I don’t like loud music or low light. I like nametags and wish more people would add keywords to them. I’ll volunteer to prepare a presentation if asked, although I’ll get stressed out about it the day before and the day of the event, and I’ll wonder why I let myself get talked into these things. I prefer to go to an event as a speaker or organizer or volunteer instead of as an attendee. Public speaking is actually easier than one-on-one conversations: you can prepare for it, and it efficiently gives lots of other people reasons to start conversations with you instead of the other way around. I don’t like being out of the house for three evenings in a row. If I need to, I duck into the bathroom for some quiet time, or I leave an event early. I drink water; if I feel the need to contribute to the venue’s proceeds, I order tea or a meal. I get wiped out after intense social events like conferences and late-night events. My blog has helped keep many conversations going. I keep my ears open for how I can help. I need to get better at asking people for advice or otherwise engaging them in my life. I like Skype chats more than coffee chats. Global reach, no timing awkwardness, no commuting, and the occasional cat. (Usually Luke, who purrs so loud that other people can hear him halfway around the world!) What’s not to like? Incredibly powerful technique. I don’t know why more people don’t use it. So I’m going to give this “secret” away, even if it means that I might have to come up with different ideas once Toronto folks catch on and start mobbing speakers for autographs. It’ll be a good problem to have, because I’ll learn from more talks. Taking notes gives you an instant follow-up excuse. I am such a lazy networker. Small talk and regular networking is hard. You’ve got to come up with a way to do enough of a “deep bump” (as Keith Ferrazzi puts it in Never Eat Alone) that you’re memorable and you’ve found something valuable for your follow-up. Notes? Notes are awesome. They work for practically everyone. Talking to someone who didn’t take notes? Offer to send them yours. Talking to someone who took notes? Offer to swap notes. That gets your e-mail conversation going, and you can take things from there. Sketchnotes are even more awesome. 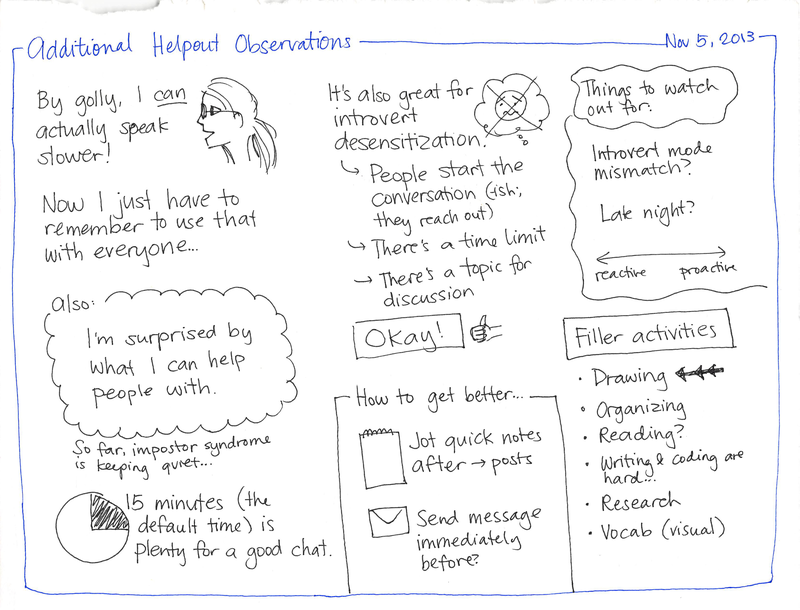 Simple notes with stick figures, colour, whatever else. Nothing fancy. But they resonate with people, they’re easy to review, and they’re fun to share. … cue the speaker’s business card, and often a deluge of business cards from other people around you. Send them all a link to your notes once you’ve posted them. Voila! You’re memorable, you’ve created something of value, you’re on people’s radars, and you can ask them questions in that e-mail in order to continue the conversation – maybe even set up a phone call or coffee get-together. Most people have never been asked for their autographs, and are delighted to oblige once they see you’re not asking them to sign a contract or a blank cheque. It’s a little weird to autograph someone’s text notes. Visual notes, though, especially with a little sketch of them? Excellent excuse to make contact. It doesn’t matter if you have a signed sketchnote or not (this isn’t like a signed first edition or anything), but it gets you that human contact with the speaker and with other people who’ve stuck around for questions.